Inspired by the beautiful pure wool fabric woven at the Abraham Moon woollen mill in Guiseley, close to our home in Yorkshire, we have designed our new Yorkshire heritage range. This range combines Yorkshire wool tweed fabric with premium Moroccan leather. The bags are made to our own designs in a workshop in Tangier, Morocco. Prices now include free standard UK delivery. 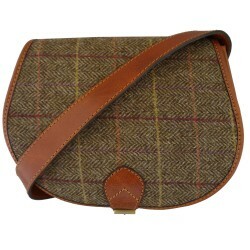 Featuring pure Yorkshire wool fabric on the front flap and front pocket, this practical rucksac..